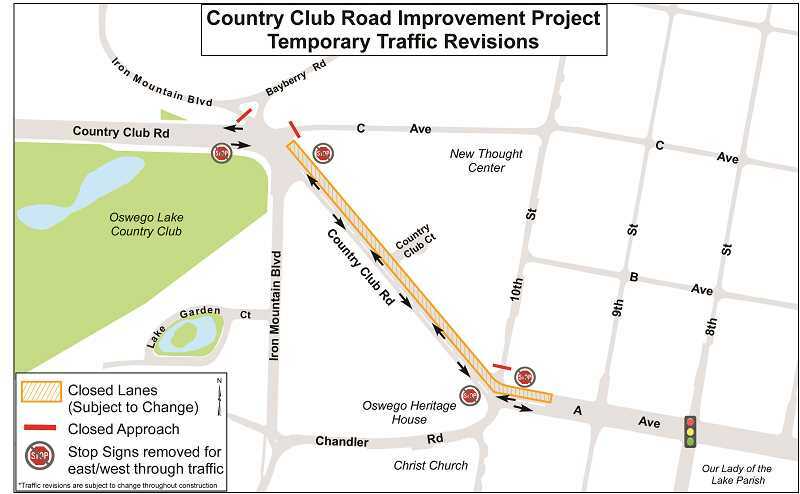 Traffic lanes along Country Club Road between 10th Street and the Six Corners intersection of Iron Mountain Boulevard, C Avenue and Bayberry Road are expected to shift a bit as crews install new water service lines across Country Club Road. The shifting is expected during daytime work hours (7 a.m.-6 p.m.) through Feb. 12; one travel lane in each direction will remain open. Once it's tested and accepted, the new water system can be put into service — the first major milestone in a project that is expected to take six to eight months to complete. City officials say all of the major utilities from 10th Street to the Six Corners intersection — as well as the pavement — are beyond repair and need replacement or upgrading. Pacific Excavation crews are also scheduled to begin work during the week of Feb. 11 on a sanitary sewer mainline on 10th Street; the company has about 120 feet of pipe to install, starting at the intersection of 10th Street and B Avenue and moving toward A Avenue. Drivers should expect delays while the work is underway, City officials say, and use alternate routes if possible through early summer. During this week's lane shifts, they also emphasize the need to follow the traffic cones or delineators and drive cautiously. Lake Oswego has so far avoided the measles outbreak that has prompted officials in Washington to declare a public health emergency, but four more cases were confirmed in Clark County, Wash., on Sunday — bringing the total to 47 — and seven more are suspected. In response, local school officials and Clackamas County Public Health are urging parents here to be on the lookout for symptoms: a high fever that may spike to 104 degrees or more; a cough; a runny nose; red, watery eyes; and a rash that breaks out 3-5 days after symptoms begin. Anyone with questions about possible exposure is encouraged to call county health officials at 503-655-8799 or contact their health care providers. Clackamas County has also scheduled a series of walk-in clinics to provide vaccines free of charge for children with no health insurance, OHP or insurance that does not cover their costs. The next one is planned from 4-7 p.m. on Wednesday, Feb. 13, at the Providence Willamette Falls Community Center (519 15th St., Oregon City). No appointment is necessary. Also this week, Albertsons and Safeway stores across Oregon and Southwest Washington announced that the measles vaccine is available in their pharmacies for children age 5 and older and adults. That includes the Albertsons in Lake Grove (16199 Boones Ferry Road; 503-635-0914) and the downtown Safeway (401 A Ave.; 503-675-4486). The shots are available Monday through Friday, 9 a.m.-9 p.m.; Saturday, 9 a.m.-6 p.m.; and Sunday, 11 a.m.-6 p.m. No appointment is necessary. "The measles vaccine isn't perfect, but one dose is 93 percent effective at preventing illness," says Dr. Alan Melnick, Clark County health officer and public health director. "The recommended two doses of the measles vaccine provide even greater protection — 97 percent."